Ada pertanyaan untuk The Terraces Apartment Resort? Ketika mengunjungi Nadi, Anda akan merasa layaknya di rumah ketika berada di The Terraces Apartment Resort yang menawarkan akomodasi berkualitas dengan layanan luar biasa. Dari sini, para tamu dapat menikmati akses mudah ke semua hal yang dapat ditemukan di sebuah kota yang aktif ini. Untuk pilihan lokasi jalan-jalan dan obyek wisata lokal, Anda tidak perlu pergi jauh-jauh karena hotel ini terletak dekat dengan Pelabuhan Denarau, Pesiar Captain Cook, Bioskop Galaxy 2. Fasilitas dan pelayanan yang ditawarkan oleh The Terraces Apartment Resort menjaminkan pengalaman menginap yang menyenangkan bagi para tamu. Ada beberapa fasilitas hotel ini seperti WiFi gratis di semua kamar, resepsionis 24 jam, penyimpanan barang, Wi-fi di tempat umum, tempat parkir mobil. Suasana The Terraces Apartment Resort tercermin di setiap kamarnya. televisi layar datar, akses internet WiFi (gratis), kamar bebas asap rokok, AC, meja tulis hanyalah beberapa dari fasilitas yang dapat Anda nikmati. Daftar lengkap fasilitas rekreasi tersedia di hotel termasuk lapangan golf (sekitar 3 km), kolam renang luar ruangan, menyelam, memancing, spa. Temukan paduan menarik dari pelayanan profesional dan sejumlah fasilitas di The Terraces Apartment Resort. I was staying there for my trip with my parents. That is very good apartment,very good location, very convenient. Of course,the staffs are all friendly, I would like to bring my families come back and stay there. Thanks for staying with us. We work hard to make our guests happy and appreciate your feedback. Thanks for staying with us. We appreciate your feedback! Warmest regards, Karishma. Tucked just behind the palms. The terraces is in a great location. 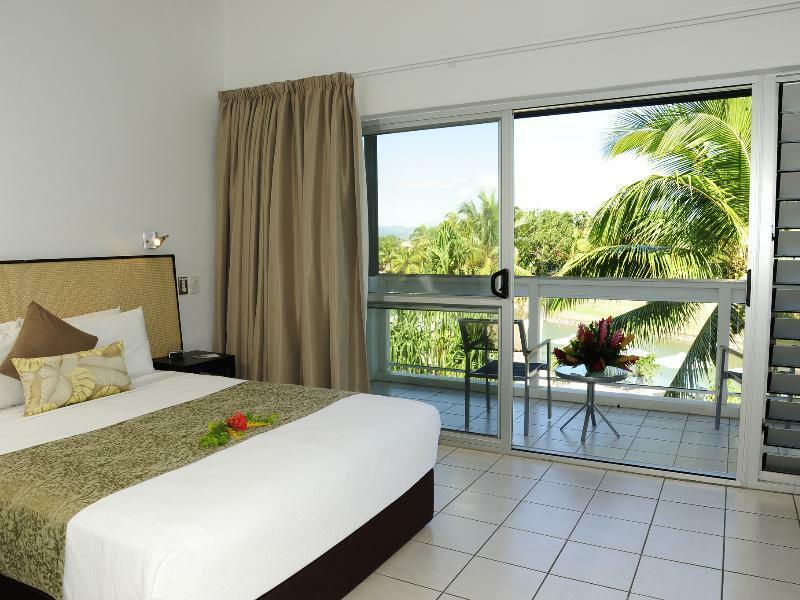 5 min walk to the Denarau shopping complex/marina and is opposite the golf course. 1 stop on the Bula bus from the shopping centre. ($8 per day or $24 for 5 days. Kids are free) If you are looking for a lavish holiday, choose one of the other resorts. If you are not going to spend a alot of your time at the resort, the terraces is great. Beds are very comfortable, especially after a long day out. There is so much space in the apartments. Would be ideal for families as the full kitchen gives you the option to cook your own meals. Recommend shopping in Nadi (Nandi, as the locals say) town as it is cheaper than the Denarau convenience store. The pool is a nice size. There is a very shallow side for smaller children to swim in. Definitely would require parents to swim with the child however. Try bookme Fiji website for deals on activities (book earlier the better). Grab a yellow taxi was only $30 Fiji from airport. We had a 3 bedroom apartment and it was spacious, clean and provided all we needed. Walking distance to the restaurants and shops in Port Denarau. The pool was nice and there is a small spa that offered great massages. The only downside is there are no beaches on this side of the island, but we were only there for 2 nights so it wasn't a big deal. Perfect for a large group of adults or those traveling with small children that want a kitchen and laundry facilities. First time staying here after many stays in main Hotel belt on Denarau Island. The pool is in a great spot with excellent views of golf course and also bar and cafe right there. Struggled a bit with lack of shelf space and a few issues with the towels and housekeeping but otherwise good place to stay. Pleasantly surprised to be upgraded to a 2 bedroom apartment.Apartment was clean and had all that you required to self cater but was becoming a bit tired. Excellent position to catch the ferry. Staff were pleasant and welcoming and would go the extra mile for you. The only negative comment is the price which is expensive for a South Pacific Island however it compares with the other accomodation on the Complex. Bula Vinaka, Thanks for staying with us. We appreciate your feedback! We sincerely apologies for the inconveniences that had caused. Warmest regards, Karishma. My group included great grandma, grandma and a single mother of 5. We were a 4 generation group. The staff at the terrace help plan a birthday party for my granddaughter and helped us plan spa treatments. The swimming pool is lovely the restaurant by the pool provided us with coffee and chai during our swim. We had wonderful tandoori chicken and veggies meals cooked to perfection. Very pleased with the staff and services. Thank you for a wonderful vacation. I had 5 young grandkids with me in my vacation and the staff were extremely helpful. Very courteous and the manager actual provide emergency service and drove my granddaughter to the hospital when we needed help. The Terraces are excellent. 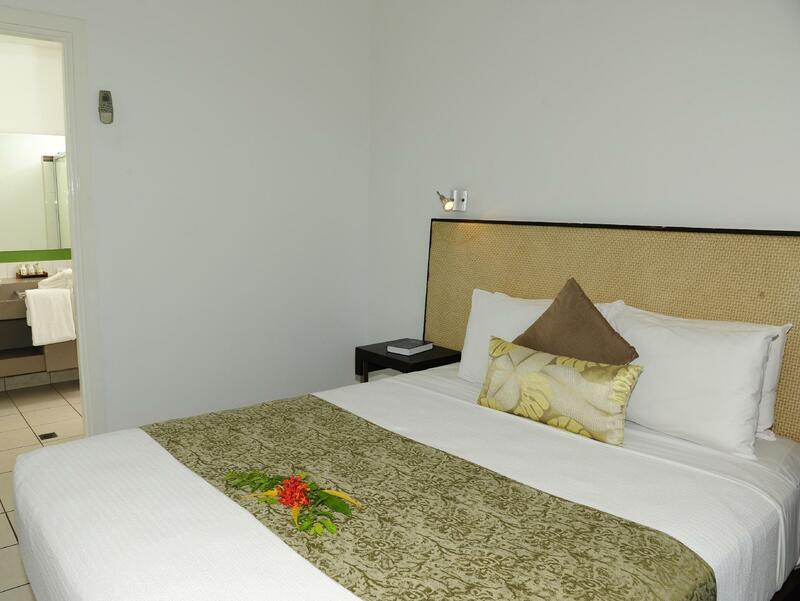 The accommodation is in serviced apartments, not hotel rooms. This means you can have more independence than hotel accommodation. The grounds are lovely, great pool (fine for laps or relaxing) and a small licensed cafe. The staff are helpful and very welcoming. The location near the Marina is ideal for groceries, transport to town or to the islands and to a range of reasonably priced and interesting restaurants. This place seems to be heavily booked, so I suggest book early. I would definitely stay again. In the first night I feel itchy in my hand and leg. In the following night I found 4 bug bed in the Bed.. Cannot sleep in the bed. I have to sleep in the sofa chair in the living room to avoid bug bed. Comfortable, clean place to come home to after a day at the Port, the Islands, or the other nearby Resorts. The apartment is nice with terraces which we can walk through to the pool or relax there with a green view, we love it so much. The negative side is cleaning that ants and cockroaches were found in the el safe/storage area and kitchen, luckily we stay there for 2 nights only. Loved the fact that it was right on the marina and had access to all the restaurants there that offered far more affordable meals compared to the pricey hotel restaurants around the town. Price was very affordable we had 2 families and booked a 2 Bedroom apartment. Only downside is no Lift available, we had a lot of luggage and a toddler which was difficult to manage up the stairs. Close walk to the shops and restaurants at Port Denarau. Nice apartment with separate rooms for kids and parents. Small function kitchen but did not have an oven. There was a percolator and coffee in the apartment which was lovely. The pool was a big hit with the kids and we went for a swim at least one today. The lady at the cafe next to the pool was a bit of a wiz because she made everything herself on scratch. The Bula bus is available for $8 per day per person which does a loop around the surrounding area and resorts. Take advantage of the dollar bus $1 each way and you pay when you're getting off the bus if you want to go into town. Staff were friendly and organise a taxi to the airport home for us. The apartments are very good option if your in transit to the outer islands due to its close proximity to the marina and ferries. 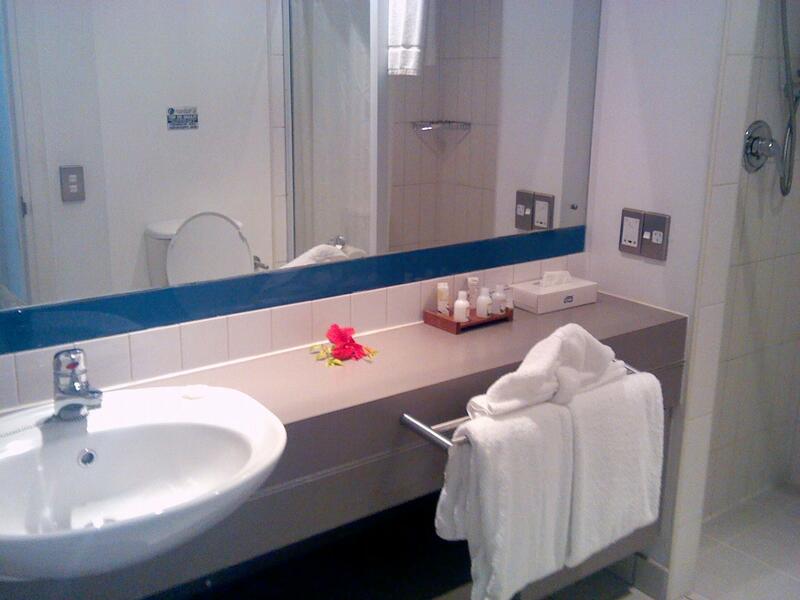 The staff here are very helpful but the facilities don't lend for a longer stay. They don't offer airport pickup which was disappointing. The food at the pool cafe was not very good. The best thing about here was it's close proximity to all the restaurants and bars at the Denaru Marina. Staff were very pleasant, helpful and courteous. Nice pool and cafe. 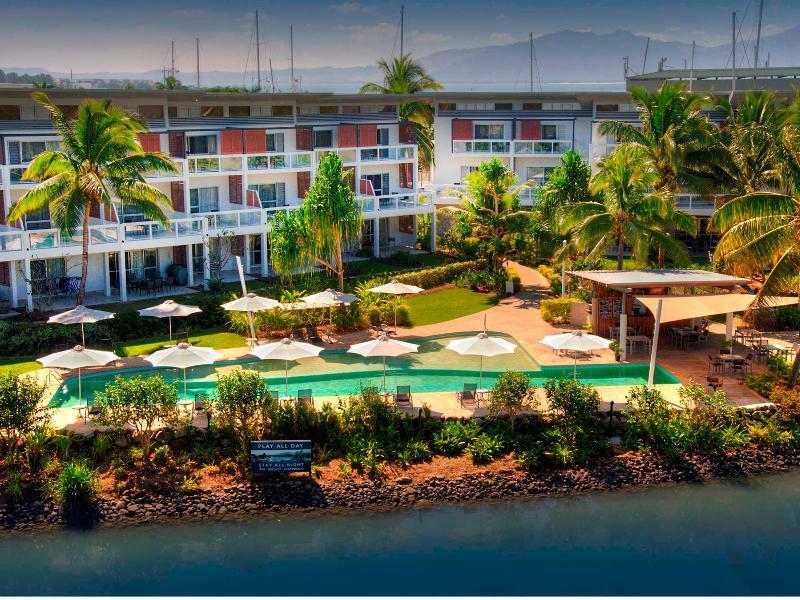 All units over look the canal and Golf Course, and only 2 mins walk across the car park to the comprehensive Denarau Shopping, Restaurants and the Marina for departures to outer Island trips and cruises. Buses regular and at doorstep. Would definately stay at The Terraces again, and recommend it to any one wanting a convenient and excellent premises to stay at on Denarau.